The standard by which all ammunition will be judged. 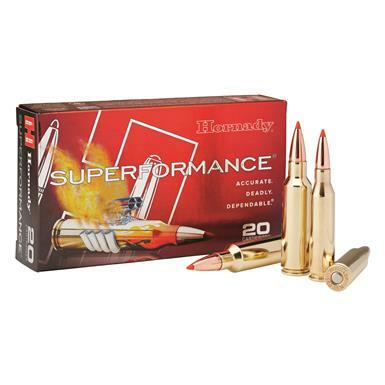 Thanks to cutting-edge technology, Superformance® Ammo is 100-200 FPS faster than conventional Ammo…no matter the gun…without increases in felt recoil, muzzle blast, temperature sensitivity fouling or decreased accuracy. Superformace® offers exceptional versatility, increased performance and is safe to use in all firearms. With Hornady GMX Superformance,® you get better velocity vs conventional ammo, no matter what gun, without the felt recoil and muzzle blast. With the GMX bullet you are getting a monolithic copper alloy that does not foul like solid copper. GMX bullets are also designed to expand 1.5 times their original diameter and retain over 95% of their original weight. These are no slouch in penetration, either. Advanced Fusion Ammo with punch.